Earlier, Warner Bros. revealed a new poster for Justice League, but that was only the beginning for a day full of reveals. The studio also announced that the Justice League trailer will debut on Saturday, March 25, to commemorate the one-year anniversary of the superhero adventure Batman v Superman: Dawn of Justice. Throughout the day, Warner Bros. has debuted brief trailer previews and character posters for both Batmamn (Ben Affleck) and Aquaman (Jason Momoa). Now we have yet another trailer preview and character poster, focusing on The Flash (Ezra Miller). Both the trailer preview and poster debuted on the official Twitter for the movie, and it seems likely that we'll be treated to trailer previews and character posters for Gal Gadot's Wonder Woman, Ray Fisher's Cyborg and possibly even Henry Cavill's Superman tomorrow, ahead of the new trailer's release. If the studio does in fact debut a Superman trailer preview, it will be the first time we've gotten any sort of official glimpse at Kal-El so far. Then again, there is certainly a good reason for keeping Superman's involvement in this story under wraps. At the end of Batman v Superman: Dawn of Justice, Henry Cavill's Superman sacrificed himself so he could kill Doomsday and save Batman, Wonder Woman and the rest of the city. The movie ended at Superman's funeral, with the final shot revealing a pile of dirt dropped on Superman's casket, with the particles levitating for a split second, before the movie cut out. Clearly, Superman will make his return at some point within the Justice League story, with director Zack Snyder going so far to say in a recent interview that Superman does play "a big part" in the movie, and both his presence and lack of presence are "major story points." Still, with roughly eight months left until Justice League hits theaters on November 17, the studio may not be ready to reveal the Man of Steel quite yet. While the rest of the Justice League characters only got one brief cameo at the end of Batman v Superman: Dawn of Justice, Ezra Miller's The Flash actually got two scenes, one, where he appears through the "speed force" during one of Bruce Wayne's "Knightmare" sequences, and the other towards the end, when Bruce Wayne is going through Lex Luthor's files and finds video footage of Barry Allen thwarting a convenience store robbery. The Comic-Con teaser trailer for Justice League also gave us a great look at Barry, particularly during his first face-to-face encounter with Bruce Wayne, where Barry quickly agrees to join Bruce Wayne's team of metahumans, since he doesn't have many friends, before asking Bruce if he can keep the Batarang that Bruce threw at him. Barry also appeared in Suicide Squad, as he apprehended Captain Boomerang. Fueled by his restored faith in humanity and inspired by Superman's selfless act, Bruce Wayne enlists the help of his newfound ally, Diana Prince, to face an even greater enemy. Together, Batman and Wonder Woman work quickly to find and recruit a team of metahumans to stand against this newly awakened threat. But despite the formation of this unprecedented league of heroes, Batman, Wonder Woman, Aquaman, Cyborg and The Flash, it may already be too late to save the planet from an assault of catastrophic proportions. Justice League also stars Amy Adams as Lois Lane, Willem Dafoe as Nuidis Vulko, Amber Heard as Mera, J.K. Simmons as Commissioner Gordon and Jesse Eisenberg as Lex Luthor. 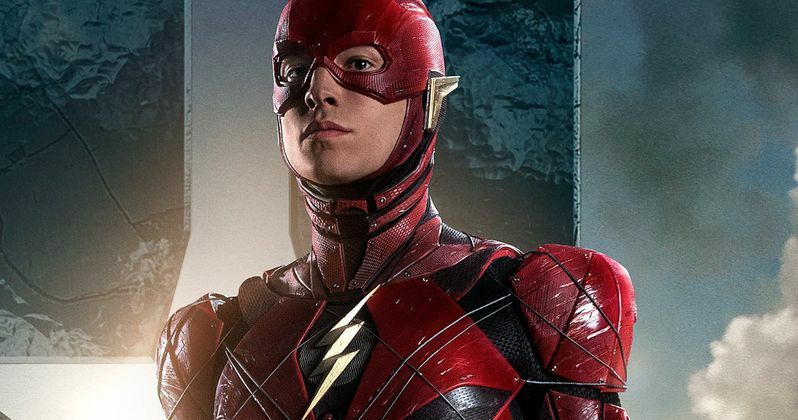 Take a look at The Flash trailer preview and character poster below for Justice League, as we get ready for the new trailer's debut this weekend.